On October 29th 2010 at 4:03 AM (JST), precisely 7 years ago, it was announced that Takeshi Shudo had passed away. He was the screenwriter of franchises such as GoShogun, Minky Momo, and some obscure little thing called Pokémon among others. A remembrance event was held at the Shin Bungeiza movie theater in Ikebukuro on June 25th 2011. This is a translation of a fan’s write-up of this event. She is a self-described older lady that has been an anime fan since the original airing of Space Warrior Baldios, for which Takeshi Shudo also did screenwriting. She runs a fan site specifically dedicated to Baldios, and goes by the alias Pajyata. Unless noted otherwise, any outgoing links in this article lead to untranslated Japanese resources. When full names are not referenced, the original article uses last names. In this translation full names are written in English order, last names referenced by the event guests are replaced with the corresponding first name, and last names referenced by write-up author Pajyata are left as last names. I have added extra context notes not contained in the original article which can be found at the end. 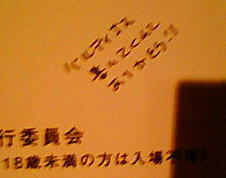 I went to the remembrance event for screenwriter Takeshi Shudo. This was the remembrance event for Takeshi Shudo, who passed away in October 2010. I arrived at Shin Bungeiza at the event’s starting time, June 25th 2011 (Saturday) 10:30PM. Originally this event was scheduled to take place on March 2011, but due to the Tohoku earthquake and tsunami, the event got postponed. I didn’t take any notes so all of this is written from memory. There are probably many discrepancies with what was actually said at the panel. Please think of this as an experience viewed through Pajyata-tinted lenses. Up to the last minute I didn’t know if I’d make it in time to get an entrance ticket that day. A few days ago the advance tickets were sold out. I was pretty anxious but I was able to purchase ticket 143. Upon entering, I also received a specially compiled remembrance anthology (Not for sale. 31 pages. 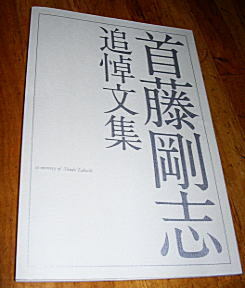 In Memory of Takeshi Shudo All Night Executive Committee Publication). The GoShogun previews screening made me feel super nostalgic. The previews got progressively sillier but as I kept watching, by the last preview I realized that it had concluded seriously (via Sabarath’s narration). Next was the main event: the panel. It started with each panelist introducing themselves and describing their relationship with Shudo. I was in charge of Takeshi’s novels for Animage. We had a shared feeling of wanting to inform later generations of Takeshi’s work, and organized this event for this purpose. Since the decline of Yamato and Gundam in the mid-80s, Takeshi was a writer of remarkable creativity that pushed the anime world further. I have fond memories of studying films with Takeshi at this very venue, Ikebukuro Bungeiza. I’m honored that this event is hosted here. I have worked with Takeshi since Isabelle of Paris. Until then, there were many actresses that were merely cute like the modern-day AKB48 idols. Those actresses were sought only for their cuteness factor. Isabelle of Paris is a drama series concerning the sociable main character Isabelle, who is a strong, self-sufficient woman. I learned a lot from this role and my versatility as an actor widened. Takeshi is one of the individuals that has influenced me the most. Afterwards, at first one by one each person recounted their individual experiences with Shudo but different panelists would chime in from time to time. It eventually became a discussion among the guests. Hence, as best as I can remember I have listed their respective remarks in bullet point form. Although that was the first time I adapted Takeshi’s script into storyboards, I really felt that there was a unique tempo that no other screenwriter had. After that was GoShogun. I am considered to be the director but that’s a stretch. There were exactly three episode directors  so that was the dynamic with which it came about… and next was Momo. It was after this point I began to talk regularly with Takeshi. A lot of time passed since Momo until Pokémon but this franchise was something with cute pictures and a journey that’s not serious. However, there were moments with deep underlying themes, and so I thought that this aligned well with Takeshi’s prior work. I requested that he be the project’s chief writer. I gave it a shot and much of the game’s staff had seen Momo, so those circumstances helped. His condition worsened and he eventually resigned from the position but I would plead with him “just one more time” and challenge him. For various reasons, in the end it didn’t work out. This sort of thing happened about 3 times over these past 2 to 3 years. The illustrations weren’t ready in time so we later matched them to the movements of the actors’ mouths. Overall it was fine doing it just once but it was unnatural due to things like the timing of breaths taken in between lines. There were also times when we re-recorded lines. 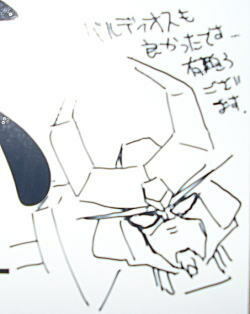 In the script for the final episode of GoShogun, for the last scene “the ultimate beauty of space” was written. No one would understand what that meant if they were told something like that. When I asked Takeshi about it he just told me “do it properly” and so I was left with that kind of a feeling. We’re people that like to get together and wail noisily. So for the singing scene in the last episode the staff got together and sung. That time was really fun for everyone. This was evident upon hearing Takeshi’s loud voice. He would tell me that we’d have a work meeting in his hotel room. But instead of talking about work we would end up talking entirely about movies. He was someone who was always curious about what others were making. Like Takeshi, he passed away at a train station. His grave is located at Itou in Izu. Takeshi and I drove to visit Shohei’s grave but I can’t remember what we talked about over there. It was a pretty long drive to Itou, and despite just being us two together I can’t remember anything about it. In the middle of the trip, at an gas station or something like that we went to to a drive-in restaurant along the sea. All I can remember was that the food tasted great. Indeed. In some aspects, he was someone that respected and held women in high esteem. After Leda, Leda 2 was in the planning stages but due to various circumstances the project vanished. It would have been a story of several girls fighting with illustrations by Mutsumi. So if it did end up being made I think it would have been a success but alas. I do not think there is anyone, nor do I think there will be anyone, that can replace Takeshi. Anime cannot be made just by one person, and so collectively we will continue to create anime. Takeshi in the heavens, please watch over us. The episode previews for GoShogun would get written at the recording studio. Takeshi had sharp ears, so he would hear our pointless chatter at the studio and actually use it in the episode previews. In the episode previews screening earlier today, there were parts where the content seemed weird to me. I think those parts come from the aforementioned pointless chatter. It was only the proposal for the setting of the story and never got produced. The robot GoShogun would not actually appear, and it was going to be a story of the five members of the team. I wrote the screenplay for Yokoso  for one episode only. I received positive feedback on the essay I wrote but I declined having it adapted into an episode. Afterwards, while I was staying in New York and they went to the trouble of making an international call and begged “please…” so I sent them only the plot details. Actually though, it really wasn’t THAT bad. Lately I’ve gotten a lot of narration work but if there’s a chance I’d really like to do some work in anime again. The actor’s zeal in me really wants to read aloud some lines again. Takeshi in the heavens, please guide me. The Time Étranger is Remy’s story. The titular robot does not appear. After the TV series, GoShogun has been presented in various other forms through novels but indeed the robot does not appear. They are stories of those five individuals. Takeshi specifically had the skill to take those characters born out of a TV series and develop them magnificently in a medium different from film or novels. The reception to The Time Étranger was positive so planning began for the next title. Takeshi attended the planning meeting but in the end it did not come to fruition. Takeshi tried to convey the ideas and images that were in his head at the meeting but they were too vague and no one at the meeting could really comprehend what he was saying. I heard the next title was going to be called Mirror’s GoShogun but this remained unwritten. The content of novel called The End of GoShogun is completely different from that plan. Remy is kinda like Mami isn’t she. That came to mind as I was observing her talk up close here. Like earlier when she got angry (the moment in the discussion when Koyama was talking about how Shudo changed her script completely and she called him in protest), it was so much like how Remy would get angry. He donated all of his scripts, drafts, and other work to the Odawara Library. Anyone can see these documents if they go through the proper procedures at the facility. Although his passing was untimely, this is how Takeshi has left his work behind. Looking at it now I think it’s wonderful that he left it behind this way. It was decided that it was going to be announced at Anime Style. The project had reached the point where the plot had been completed. He replied along the lines of “some work suddenly came up….” many times and the project remained stagnant. Precisely a month before he passed away, an all-night event just like this one was hosted at this same venue Bungeiza. Takeshi had come to this event. From the stage I caught glimpses of a face that looked just like Takeshi’s but the complexion looked off so I thought it I was probably mistaken. During the break, I went outside and he waved at me. I thought “ah-ha, it was Takeshi after all.” He went “shhh” (he made the gesture of putting his index finger to his mouth). I realized that he wanted me to keep this a secret so I kept it that way, and called him the next day. He said, “I was interested in director Katabuchi so I went.” Just when I thought “well if he’s healthy enough to come to the all night event then that’s a relief” . . .
At the end, Hiroshi Watanabe got up from the attendee seats and was called up to the to the stage (“I’ve been invited to the hotel conference too!” He got on the stage with a smile). A fierce rock-paper-scissors tournament occurred for an EP record of the Minky Momo theme song and a CD, both signed by Koyama. It ended with these presents being given to three people. Then we had an intermission before the screening of the four films. 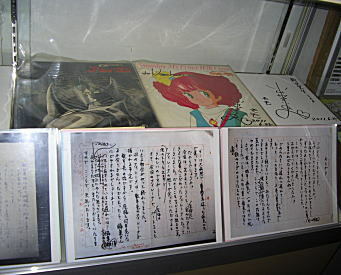 In the passageways there were original manuscripts and related signed articles on display. 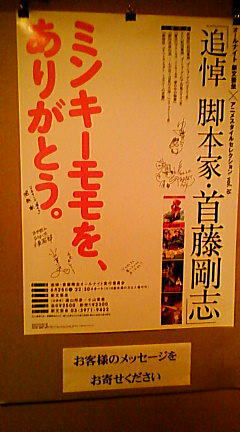 There were also posters on which the guests signed and left a message. Attendees were also allowed to write a message if they wanted. Sign below poster: Attendees, please leave a message. So I also left a message. Handwritten text: Thank you for writing Baldios! Text: Baldios was also great. Thank you. Baldios stories haven’t really (or rather, have barely) come out but Shudo’s accomplishments in Baldios were great. And like this, I’ve now reached the second time I’ve written about a memorial event since Haneda’s passing in 2007. I shuddered at the thought of how many more times I might do something like this. These last couple of years, I have heard of the passing of many of these kinds of people. The people who created the entertainment that would excite me back in the day. Those people whom I adored. When Shiozawa  and Haneda passed away, the shock was so great that I screamed, “why! !” At that time the feeling of anger was stronger (perhaps because I was younger then). As things proceed like this, rather than some kind of resignation, I feel beaten down by the reality of the inevitable passing of these people. It hurts. Shudo is the god that created my beloved Baldios. Even if he were to appear frail, I arbitrarily thought that through some special means somehow or other he’d always be healthy! The mood at the venue was really great. It was warm and heartrending, and the stories from all the guests about Shudo were wonderful. There were also Remy cosplayers at the venue ☆ (two of them!! One in the red fighter suit and another in The Time Étranger jumpsuit). Mostly the same group of people attended the wake. It’s not like I am that familiar with his work outside of Baldios and I don’t consider myself to be a super huge fan, but I still wanted to go no matter what. After burning the incense, we all went to the trouble to get together so we proceeded to drink merrily, eat, and chat. Depending on how you look at it, doing these things in mourning dress may be considered extremely imprudent behavior. However, once you become an adult, gathering in large numbers becomes pretty difficult. “Thank you for giving us this time for fun Shudo!” I thought, as I drank at a pace faster than usual. When a famous person passes away, typically it’s not someone with whom we feel close. It’s not like we’d particularly feel sad, right? We feel shock and sadness upon hearing of someone’s passing because we liked that particular person. In my own way, I liked Shudo (he was the kind of person who in some way or another conveyed himself through his writing). So I do feel some sadness due to this but more than that it’s because I have consumed so much of his work. But… as far as the “memorial” is concerned please forgive me. Besides her fan site, Pajyata can be found on Twitter.